The Garden of the Gods Park is a registered National Natural Landmark in Colorado Springs. What makes this park even more amazing is the free admission. What you should expect to see are large sandstone rocks that extend upwards of 300 feet. You have the option of driving through a self guided tour, which is what I ended up doing. But if you're feeling more adventurous, there are many more hiking trails to get up and close to the rocks. Since we had a tight schedule and the weather was cloudy with signs of rain, we opted to drive around the park. All the roads were paved and there are pull-off areas where you can enjoy the view. Additionally, we noticed many larger parking lots for easy access to trailheads. Like most other touristy spots, there is a gift shop. Except this gift shop, what they called a Trading Depot, was huge. In addition to the various gifts to purchase, it's a good place to grab a quick bite and a use the restroom before beginning your adventure in the park. If I had more time and the weather was more cooperative, Garden of the Gods Park is a place I would want to spend at least a few hours hiking. Bring plenty of sunscreen and lots of water, as there is limited shade. And because we're visiting from California (sea level), be prepared for the elevation change, which may make hiking more difficult for some people. If you're in Colorado Springs, this is a must do. If you only have half an hour, that's enough time to do a quick drive through. If you have more time, prepare for a nice hike. 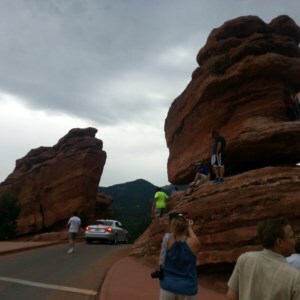 We made the drive from Denver to visit both Pike Peak and Garden of the Gods. In an event, the Garden of the Gods Park is well worth the visit.